Perry Committee votes for criminal sanctions for hareidi non-enlistment. The Perry Committee for Equal Burden of Service voted Wednesday to impose criminal sanctions on hareidi-religious men who do not enlist in the army. Minister of Defense Moshe “Bogie” Yaalon (Likud) voted against the measure, as did Housing Minister Uri Ariel (Bayit Yehudi). Minister of Environmental Protection Amir Peretz (Hatnua) abstained. Yaalon reportedly ignored a direct order from Prime Minister Binyamin Netanyahu to vote for the measure. The issue of criminal sanctions had nearly caused a coalition crisis. The last meeting of the Perry Committee ended in conflict after Yaalon rejected calls to punish hareidi men for non-enlistment. 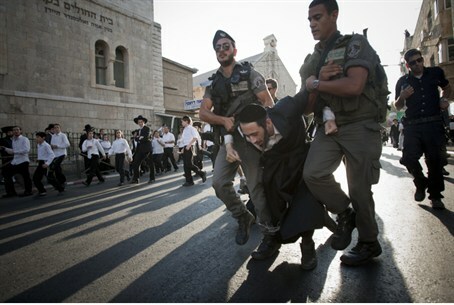 “As soon as you condemn an entire sector of society and threaten that Torah students will go to jail, you have the opposite effect [of enlistment],” he warned. On Wednesday, former IDF Manpower Directorate head MK Elazar Stern warned against criminal sanctions as well. "We can't put thousands of people in jail," he argued. Members of Yesh Atid declared that they would insist on criminal sanctions.